It’s 5 a.m. in the morning and it’s 26 degrees out. I wonder how many more homeless people will die this winter on the Central Coast from hypothermia. We have so many volunteers signed up, excited to begin building tiny homes with our homeless people. 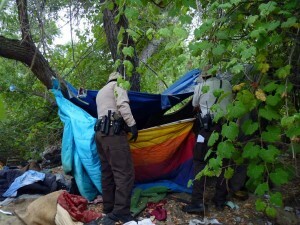 Folks realize the punishment homeless people take in the winter (and all year long)…not having bathrooms to use in the evenings, no public showers in all of SLO, no public place where they are even allowed to take a nap after being up all night. One veteran and his wife in North County told me if they sit upright all night on the bus bench, the police won’t ticket them. For illegal lodging. What is illegal about sleep? We all need it. We all know that sleep deprivation is used as a means of torture. Why do we torture people without housing? How did we get to a place in society where we punish those who are less fortunate than us? Give them tickets for illegal lodging instead of trying to help them? We’ve made poverty into a business. Passing out tickets (even to our veterans and elderly) to those trying to get some rest. When was the last time you went a few nights without sleep? Yes, we have many wonderful services and programs, and many good-hearted people working hard to run those programs. Many are helped into housing. But some fall into the gap in services. Some do not qualify for housing, or even shelter. Some are literally on the streets with no access to shelter, clean water, toilets, showers, laundry facilities, telephones, etc. Many have no family. We will be their family. This is archaic. We live in a crazy world where 400,000 drones fly over the country unchecked; we routinely go to the moon and back, robots perform surgery and it looks like we’ll soon have driverless vehicles. People from other countries strap bombs onto their bodies blowing themselves into a million pieces in order to kill others, and we can’t figure out how to help our human friends more than our animal friends? How did we become so uncaring? We are so blessed to live in this pristine place we call home. We just need a little more love in our hearts. Please call your supervisor or city council member. Ask them to help Hope’s Village find five acres of land. San Luis Obispo County Planning and Building is making the time to work with us. We are a 501(c)(3) California corporation; we have our business plan, by-laws, and money in the bank. We can get 60 more homeless people out of the bushes, off the streets, and into real stick-built tiny homes in the first village alone. This isn’t rocket science…it’s compassion. Becky Jorgeson is a long time homeless advocate and the founder of Hopes Village of SLO. We have a responsibility to help those who want to help themselves but we are tired of the free loaders sucking society dry. We have an extra responsibility to our Vets and to take care of them and get them on track but everyone else should be doing some type of work to feel they earned their keep. I often feel worse for the dogs who get adopted by homeless. Oh, and by the way….although flawless counts are impossible to come by – the transient nature of homeless populations presents a major difficulty – the U.S. Department of Housing and Urban Development (HUD) estimates that 47,725 veterans are homeless on any given night. Perhaps it’s time to rethink how you think. yes we are tired of free loaders sucking our society dry. they arent the homeless. they are the free loading politicians and civil servants of our society who claim to be helping us. for example, we spend $1T a year on programs for the poor, or $88K per family of five living in poverty, yet we still have 42M people living in poverty. Why? because that money goes to the free loading scum suckers in our government as “admin expense” claiming to help those in need. WOW, Tell it like it is josey. You’re so right. What defines someone as a freeloader? Does it mean they provide absolutely NOTHING to society, or does it mean they try to take far more than they put in? Say, for example, the police in San Luis Obispo making $250,000 a year. Did they find a way to magically do the job of 3 people, or are they doing the same job they were doing 15 years ago for three times the money? To me, that would be a freeloader. Maybe if we reduced compensation to reasonable levels, we could afford to throw the homeless, freeloading or not, a crumb or two without even minding? yep, my definition of a freeloader. SLOPD. I don’t think the SLOPD make 250K annual salary. That is absurd. If they are earning anything close to that, something is very wrong because the SOCAL LEO don’t make anything close to that although the environment down there presents a far greater danger. SLO is a cushy job in the LEO world. I can assure you that every LA LEO an their families would be lined up for a cop job in SLO for less than half the pay that you quoted. Are you sure that you know what you’re talking about? The basic problem is that “if you build it, they will come”. The more shelter, food, money etc… that we provide, the more homeless will come. It’s impossible to help many homeless people because no one can safely live with them. I know a couple of handfuls of homeless who have basically checked out. They want nothing to do with housing, jobs or the normal things you and I strive for. The majority of them are alcoholic/addicts with a smattering of those with mental issues. About the only reason they “appear” wanting more for themselves is so you’ll hand them what you have in your hand at the time. “If you do this I’ll give you this”. For those in charge of warming stations, food kitchens and all that I say “thank you”! There are many who are just in desperate times due to circumstances BEYOND their control however, most are where they are because of decisions they made. Don’t misunderstand me, I DON’T feel its mankind’s prerogative to punish the bad decision makers among us or we’d ALL be in bad shape wouldn’t we? I think progress can happen when we ratchet back this groundswell of shelter building, food handing, excuse making group that we’ve grown to accept as normal. We’re crippling our people and don’t even get me started on handing lazy people pot! Give a man a fish and he’ll eat today. Teach a man to fish and he’ll feed his family forever! Thank You Becky for understanding and for caring. The problems we have with our local mental health system and organizations like CAPSLO is that they have a one-sized fits all definition of mental illness and homelessness. For the majority of people, the local shelters and churches and mental health system works well. Unfortunately, for the most seriously mentally ill, it does not work at all. Some types of mental illness affects people differently. There are those who cannot be in close quarters with others.Others who are Dual Diagnosed (mentally ill and addicts) are unable to meet the strict requirements of zero levels of alcohol. Hitting bottom doesn’t work for alcoholics who are mentally ill.
An analogy for the mentally ill addicts on the street is like the person who has Stage 4 cancer. The most seriously diseased. mej, Thank You for the link. The Seattle program makes perfect sense. I abhor the way CAPSLO treats the homeless. There clearly is something that can be done if the people who run these programs would get off their egotistical high horses and stop alienating the people that they should be helping. The state needs to get involved and require cities to set up adequate programs that work with clear guide lines and “practices”. If all cities were required to implement a program of identical design (whatever that design might be), we wouldn’t have to worry about the homeless migrating. My heart breaks for the homeless who are cold, hungry, weak, confused, tired, sick, alone and unloved . I don’t care how they got where they’re at, they are now in a situation that they can’t get out of and I for one want to see them cared for. The terribly difficult reality is that if a place like SLO readily offers “shelter, clean water, toilets, showers, laundry facilities, telephones, etc.” to the homeless, there will be an unending number of homeless migrating to SLO to take advantage of these services. If we build it, they will come. The days of a city like SLO “taking care of its own” are long gone. That is a profound problem with no easy answers. Yep. It gets cold. It also rains. That’s why, for your basic needs of food and shelter, most people keep it together and stay off drugs, get a job, and pay rent. I’m all for supporting those in need short term and donate monthly to support these programs. When the individuals are idiots and can’t behave or choose drugs, I have very little sympathy. Sorry. Amen… The outcome of your life is the sum total of the decisions and choices that you have made. If it’s too cold on the central coast, then migrate to a warmer climate. I’ll pay the bus fare. While what you say is true, people do find themselves in homeless situations through no fault of their own. Such as the person who gets sick and can’t do the work they used to do. There are many reasons for homelessness as many people live week to week and a simple job loss can cause one to find themselves out on the street. Likewise, there are people who become mentally ill and turn to self medication. Mental illness is not a choice, it’s a disease and it’s no ones fault. There are also alcoholics who can not stop drinking. Life is too hard and there isn’t enough reason to live ( their perception), in other words they don’t care if they die and hope that they do but they don’t die and they seem to wake up every morning, cold, tired, sick and wanting another drink. Many of these people are not like the rest of us who have ever earned enough to put funds into savings or investments. They lived week to week on minimum wage (as if that’s even possible these days). Count your blessing and have some heart. In the north county there I is a new organization, Paso Cares. They provide shelter when the temp drops below 35. The other nite when the low was 25, only 4 people took advantage of shelter. Yes, there is a problem and relief is available. Why the homeless don’t engage is beyond me. I never heard of your organization before, who are your pricipals? You are correct it is horrible that American citizens are forsaken. But there are many things that can be done about it: We need to prevent illegal immigration to the US, illegals are taking up resources that could be better used on citizens: We need all government employees to be less wasteful, after it is they who are being paid to take care of the programs that help the poor, the needy, the homeless. As a society we need to better allocate resources, it is nice that we waste millions on “diversity training” but I would rather see the money go to helping our down and out citizens. The federal government needs to stop sending billions to help foreign governments, use that money to help US citizens. One trip for Obama and his entourage to go to Paris for the summit on global warming could have built housing for maybe two hundred homeless, add up all of his trips and that of all top US politicians and we have provided housing to most homeless. How about state pension, imagine how much money could be used for the homeless if all state, city and county employees were covered by social security and a 401(k) like the rest of us. All of this during one cup of coffee, imagine what we could come up with if the government was actually serious about helping citizens rather than helping themselves? An overtaxed citizen who takes care of many within his family group through hard work and sacrifice.